This will work on any blower system. Put the snow anywhere you want it and never leave your tractor seat! This greatly increases the life the actuator when used in bad weather. Plus you get all the hardware needed to mount the actuator to your chute (all stainless). Chute Deflector kit. 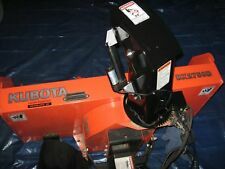 For Kubota BX5450 Snowblower and more.Similar to GB2513. Will work on Kubota B2650, BX2750, BX2816, BX5450, B2772 B2781, B2782, B2789, BLM3164. Photos shown on a BX2750D. Similar to Kubota GB2513 deflector kit. No more getting off tractor to raise or lower chute. Kubota Diesel Hydrostatic 4x4 GF1800 + SnowBlower Snow Machine Package! The tractor has super low hours which are all original (703 Hours). These 4x4 versions are hard to find and you wont find a better priced one out there! Machine is sold as it is as all of are used machines are. 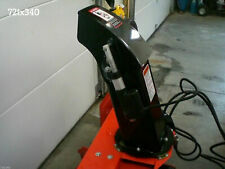 Not new but never used Kubota L2195A Snow blower. 72" wide cut path with hydraulic chute rotation and L2179 electric deflector kit. It is in excellent shape. Works with Kubota L40 series Grand tractors. B2550 (50" ECONO. SNOWBLOWER) B2550C(S. 2010000 AND UP) (50" ECONO. SNOWBLOWER) BX2750 (50" FRONT SNOWBLOWER) BX2750(S. ;>=9900101) (50" FRONT SNOWBLOWER) BX2750A(S. 2303678 AND UP) BX2750A(S. ). Other standard & high-flow models with different widths & fans sizes are available. Our New Holland L190 skid steer is one of our most used and valuable assets in our farming operation. After our conversation it was clear the Skid Pro broom had a leg-up on quality over the Bobcat. 2018 KUBOTA BX2370 SUB COMPACT TRACTOR/LOADER/SNOWBLOWER 119 HRS 4WD CLEAN! 2018 KUBOTA BX2370 TRACTOR/LOADER/SNOWBLOWER. This is one NICE machine! And the tractor only has 119 hrs on it. The snowblower is older than the tractor. This tractor is barely broken in! Runs like a charm! Other standard & high-flow models with larger widths & fans are available. Our New Holland L190 skid steer is one of our most used and valuable assets in our farming operation. After our conversation it was clear the Skid Pro broom had a leg-up on quality over the Bobcat. Other standard & high-flow models with different widths & fan sizes available. Our New Holland L190 skid steer is one of our most used and valuable assets in our farming operation. After our conversation it was clear the Skid Pro broom had a leg-up on quality over the Bobcat. Our New Holland L190 skid steer is one of our most used and valuable assets in our farming operation. After our conversation it was clear the Skid Pro broom had a leg-up on quality over the Bobcat. I was even more impressed with the quality and construction after seeing it in person. Other standard & high-flow models with different widths & fan sizes are available. Our New Holland L190 skid steer is one of our most used and valuable assets in our farming operation. After our conversation it was clear the Skid Pro broom had a leg-up on quality over the Bobcat. 2 OEM KUBOTA HYDRAULIC OIL FILTERS HHTA0-37710. Part Number: HHTA0-37710. MAKE SURE THIS IS RIGHT FOR YOU. For sale. Kubota T2738 Heavy Duty Snowblower Chute - Used. This kit allows you to Rear Mount on your tractors existing 3 Point Hitch Kubota Snowblowers B27281 or B2782. Box was opened and all parts accounted for on the assembly list included from Kubota. Hardware bag is sealed and never been opened. This is a Genuine OEM Kubota Part. California Prop 65 - This product can expose you to certain chemicals, which are known to the State of California to cause cancer or birth defects or other reproductive harm. New Landpride/Kubota 96" snow pusher for skid steers. Suitable for skid steers with between 70-99 horsepower. Manassas, Va 2011. 7274 Centreville Rd. Unlike many OEM skid shoes, Robalons are reversible which make them more cost effective than a tradition skid shoe. includes mounting bolts. This is a Genuine OEM Kubota Part. Canceling Your Order. Kubota: 316, 463, B7300, B7400, B7410, BX1500, BX1800, BX1830, BX1850, BX1860, BX2230, BX2350, BX2360, BX24, BX25, G1800, G1900, G2000, G2160, G3200, GF1800, GF1800E, KX41-3, PC09, RTV500, RTV900, T1600, TG1860, TX525, U17, ZD18, ZD21, ZD321, ZD323, ZG222 and ZG227. FROM AN ESTATE CHECK BACK FOR MORE.